What’s the best way to visit Norway? Call us biased, but we think it’s by ship. Norway is, hands down, one of the most picturesque countries in the world. Famous for staggering fjords and majestic waterfalls, the scenery is best taken in from the sea. Norway’s coastline is dotted with charming hamlets, each one a gateway to a new adventure. On a cruise, you can enjoy both the journey and the destinations. Getting from one stop on your itinerary to the next is a travel experience in and of itself when you’re gliding by scenic vistas on a floating boutique hotel. You can easily spend a two-week vacation exploring Norway by land and by sea. That’s why it's one of the countries where we offer our unique country-intensive voyages. These itineraries are devoted to exploring just one country. They give travelers enough time to truly take in the atmosphere and culture of a place. After all, you’re on vacation – why rush? And in a country a stunning as Norway, you're going to want to soak up every possible moment. How you spend those moments, well, that's up to you. Our wide range of shore excursions offers something for everyone. On an Azamara cruise to Norway, you’ll be able to craft a unique travel experience that perfectly suits your needs. Of course, some Norway experiences simply shouldn’t be skipped. Here are seven of the best things to do while you’re there. 1. Embrace the Norwegian “free air life”. Practice saying this word: friluftsliv. (It’s pronounced free-looft-sleeve.) Friluftsliv translates to “free air life” and refers to the deep-rooted Norwegian philosophy of appreciating nature. Think of it as the opposite of the Danish word hygge (the art of living cozily that is currently a subject of fascination, and many a book, in North America). Like Denmark, Norway consistently ranks as one of the world’s happiest countries. In fact, they took the number one spot in 2017. Spending time in the great outdoors is an integral part of Norwegian culture and an aspect of life that is often attributed to the nation’s collective happiness. If you want to experience Norway like a local, get outside. It’s easy to embrace friluftsliv at your own pace during a Norwegian cruise. Hiking and biking are both excellent ways to take in the stunning scenery, get some fresh air, and experience Norway like a local. Driving or taking a funicular up a mountain will deliver stunning views and will lead you to the perfect starting point for a downhill hike or bike ride. Take frequent breaks to enjoy panoramic views at look-offs. In Bergen, take the funicular to the top of Mount Fløyen. 2. Chase waterfalls and cruise fjords. In addition to hiking and biking, you can partake in friluftsliv by taking to the water. 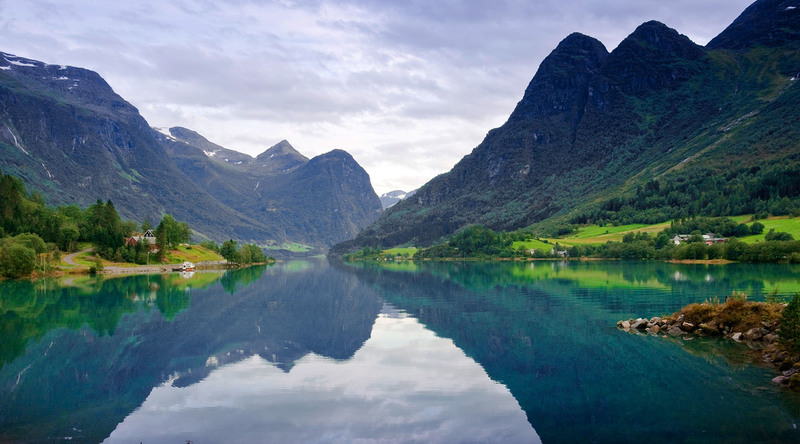 No trip to Norway is complete without exploring the country’s pristine lakes and astounding fjords. Simply cruising onboard the Azamara Journey allows for one unforgettable experience: traveling through Trollfjord, famed for its narrow entrance and steep cliffs. Another of Norway’s most famous fjords is Geirangerfjord. If you’re feeling adventurous, take in the UNESCO Heritage Site during a RIB boat tour. Prefer a slower pace? You can kayak the sparkling waters instead, getting up close and personal to the famous Seven Sisters waterfalls. In a country of dramatic landscapes, the Lofoten archipelago stands out among the most breathtaking. Bridges and tunnels connect four main islands -Austvågøy, Vestvågøy, Flakstadøy, and Moskenesøy – while smaller, jagged, mountainous islands and skerries emerge from the sea all around. A RIB boat tour is the perfect way to see the area’s unique scenery, traditional fishing villages, and local wildlife. 3. Ride the rails in Flåm. Flåm is a small town that packs a big punch. It sits above Sognefjord, Norway’s largest and most famous fjord. The town is best known for the Flåm Railway, a 12.5-mile long route that climbs more than 2,800 feet from sea level. For peak sightseeing, the train moves at a slow pace and even stops at viewpoints along the way. You can experience the famous railway during an excursion with Azamara! The Flåm Railway is simply a quintessential Norwegian experience that shouldn’t be missed. And if you need more convincing – not that you should – a stop at the Vatnahalsen Mountain Hotel mid-journey means getting to dine on traditional Norwegian waffles with sour cream and jam. Yum! Speaking of food, don’t miss indulging in Norway’s traditional cuisine during your voyage. Fish and seafood aren’t just key parts of local food – they’re integral to local culture as well. As you cruise the fjords, you’ll notice tiny fishing villages along the coast. From Svolvaer, you can visit the UNESCO Heritage Site of Nusfjord. It’s one of Norway’s oldest fishing villages and offers a fascinating inside look at what life used to be like. Another Azamara shore excursion offers the opportunity to visit a family farm in Aurland, Norway. There’s no better way to learn about local life than by talking to and dining with locals themselves. While in Norway, dining on local seafood is a must. Smoked salmon is a huge export and widely considered to be Norway’s most notable contribution to modern international cuisine. Trout, cod, herring, and sardines are also common. Shellfish, particularly king crab, is also popular. Norwegians will gather for a krabbefest, or “crab feast”. Typically held outdoors, live crabs will be cooked and immediately served with bread, mayonnaise, and lemon. Foodies will enjoy going on a king crab fishing expedition in Sarnesfjord, or a crayfish trip in Nordfjord. Both local delicacies are served as rustic meals with fresh bread, mayonnaise, and lemon. Fishing tours are a great way to explore Norway’s beautiful fjords, learn about local fishing techniques, and partake in a delectable, authentic Norwegian meal. When it comes to Northern European cities, Oslo is something of a hidden gem. While Copenhagen and Stockholm have an ongoing rivalry for the most popular Scandinavian city, Oslo is quietly great. What makes Oslo so appealing? It’s a cultural hub. It’s home to striking architecture, a renowned Opera and Ballet, fantastic restaurants, beautiful parks, and several incredible museums. The Munch Museum: Dedicated to the works of Nordic painter Edvard Munch. Astrup Fearnley Museet: This collection of modern and contemporary art is considered one of the best in Northern Europe, and is housed in a stunning building designed by Italian architect Renzo Piano. Don’t miss the Tjuvholmen Sculpture Park next door. Nasjonalgalleriet: Norway’s National Gallery is the country’s largest collection of paintings, sculptures, and drawings. Here, you can see Edvard Munch’s The Scream as well as works by Manet and Cezanne. The popular Fairy Tale Room displays art depicting trolls, princesses, and other fabled creatures. Vikingskipshuset: The Viking Ship Museum is part of the University of Oslo’s Museum of Cultural History. It houses three incredible Viking ships, the most famous being the completely whole Oseberg Ship, as well as other artifacts. Norsk Folkemuseum: One of Oslo’s top attractions is this large open-air museum dedicated to Norwegian history. It boasts 155 traditional houses and a stave church from the year 1200. The museum’s exhibit on Sami culture is a highlight. Historisk Museum: The Historic Museum boasts three collections, the most renowned being the ground floor National Antiquities Collection. Visiting is a must for anyone interesting in Viking history. Norsk Maritimt Museum: The Norwegian Maritime Museum is dedicated to the relationship between Norwegian culture and the sea. Visiting is a must for those interested in shipbuilding and fishing. Bymuseet: The Museum of Oslo is dedicated to the city’s own history and features paintings, photographs, and models. Download the museum’s augmented reality app “The City Detective” for an interactive experience. Nobels Fredssenter: This museum celebrates the lives and contributions of Nobel Peace Prize recipients. Digital displays, a movie theatre, and intriguing temporary exhibitions make it a cutting-edge institution. Holmenkollen Ski Jump & Museum: More than just a museum, this hilltop landmark boasts a ski jump and an observation deck offering panoramic views of the city below. The museum explores over 4,000 years of skiing history. 6. Journey to the Land of the Midnight Sun. Part of Norway’s mainland and several islands are found above the Arctic Circle, often referred to as the “Land of the Midnight Sun”. A midnight sun occurs during summer months when the sun is visible for the full 24 hours. Visiting this remote part of the world is a highlight of any cruise to Norway. Tromsø, Norway, is the northernmost city in the world with a population above 50,000. It’s a cultural hub in Northern Norway with a significant student population and a surprisingly warm climate, given its locale, thanks to the Gulf Stream. One of Tromsø’s most famous landmarks is the Arctic Cathedral, an iconic church built from glass and concrete. What makes Tromsø particularly interesting to visit, though, is that it’s home to the indigenous Sami people. Visit the Wilderness Center to learn about Sami history and heritage – and to visit with the 300 huskies that reside there. From the Wilderness Center, you can enjoy guided walks, kayaking, and dog-sledding. You can enjoy a wilderness hike with the huskies during our Cruise Global, Walk Local shore excursion. Even further north from Tromsø is Honningsvag, the last village before the North Cape. This cape along the island of Magerøya’s northern coast is where the North Sea meets the Arctic Sea. The area’s main attraction is a flat, plateaued cliff over 1,000 feet high that offers sweeping vistas and a view of the famed midnight sun. Back in Honningsvag, grab a cocktail at the Artico Ice Bar. 7. Fall in love with the glaciers and lakes of Olden. Have you ever seen an emerald green lake? You will when you cruise to Olden, Norway. The serene village sits on the edge of the massive Jostedal Glacier. In fact, it’s the largest glacier in all of continental Europe, covering 188 square miles. The most famous glacier arm of Jostedalsbreen, as it’s called in Norway, is Briksdalsbreen. During our Cruise Global, Walk Local shore excursion, you can trek the rugged terrain surrounding the mighty frozen glacier, taking in some of the most stunning scenery in Norway. The glacial waters melt to form lakes of such vivid colors they must be seen to be believed. For a more leisurely experience, you can take in the scenery while cruising Lake Olden on a passenger boat. Or, leave Olden for the nearby Lodal Valley and its famous Kjenndalen Glacier. Lake Loen is known for being particularly green in color because the glacier is constantly crushing up rock and clay particles, which are carried into the lake by rivers. Of course, these seven things only begin to scratch the surface of things to see and do in Norway! To truly understand all that the country has to offer, you’ll simply have to join us on a voyage.